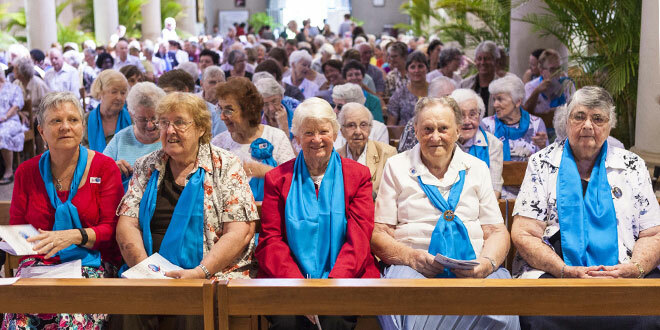 JOSEPHITES across Australia marked the order’s 150th anniversary in Masses throughout the country last week, with particular gratitude in Queensland. Without the perseverance of the sisters in the early 1900s, the Sisters of St Joseph of the Sacred Heart may not have gathered in Brisbane on March 19 to celebrate a sesquicentenary at all. Sr Mary MacKillop and her sisters arrived in Brisbane on December 1, 1869, at the invitation of the archdiocese’s first bishop James Quinn. Over the next 10 years, the sisters in the distinguishable brown habit established 14 schools, an orphanage in Mackay and taught about half of all Catholic students in the archdiocese. Of the order’s growing numbers, more than 60 had come from Queensland. But, due to a controversy into how the sisters governed their schools, Bishop Quinn asked the Josephites to leave the archdiocese. The shock dismissal came just eight years after Mary MacKillop’s excommunication from the Catholic Church in 1871. The sisters eventually returned to Queensland in 1900, to establish a school in the newly formed Rockhampton diocese, but they would not return to Brisbane until 1915. 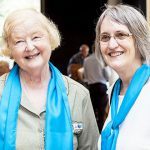 The Brisbane story was retold to the Sisters of St Joseph from Brisbane and surrounding dioceses at their sesquicentenary Mass at St Stephen’s Cathedral on March 19. 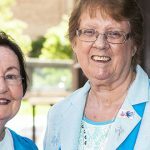 Josephite Sister Marie Dowling, originally from Inglewood in Toowoomba diocese, said the story of the order’s exile and eventual return to Queensland was at the heart of all Brisbane Sisters of St Joseph. “It really shows the forgiving and reconciling heart of Mary MacKillop,” Sr Dowling said. She said the Mass captured the “spirit of gratitude” exclaimed by both St Mary of the Cross MacKillop and the congregations in Queensland. “There was a sense of rejoicing,” she said. 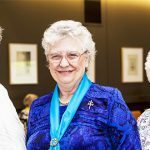 Sr Dowling, who celebrates 50 years as a Josephite, is the order’s representative for the Sisters of Perpetual Adoration, a Brisbane-based community sharing the same founding father as the Josephites, Fr Julian Tenison Woods. TransPacifico regional leader for the Sisters of St Joseph Sr Annette Arnold said the Mass united the sisters with people they had ministered to during Queensland’s Josephite history. These included students from their schools, people caring for them in nursing homes and even women who had joined the order in previous years. “There is a partnership, that we are, together, part of God’s call to be missionaries in the world,” Sr Arnold said. Helping others: Sr Marita Coffey (left), Sr Rita Flynn and Sr Zita Power at the 150th anniversary of the Sisters of St Joseph. 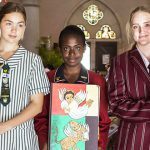 Schools representative: Our Lady’s College’s Matisse Jacobs (left), Mary MacKillop College’s Bethany Tukana and Clairvaux MacKillop College’s Riley Arther at the Mass for the 150th anniversary of the Sisters of St Joseph at the Cathedral of St Stephen on the feast of St Joseph (March 19) last weekend. Inglewood link: Sr Marie Dowling (left) and Sr Janet McDougall, originally from Inglewood, at the 150th anniversary Mass in Brisbane. Sisters of St Joseph around Australia were celebrating the anniversary of of the order established by St Mary of the Cross MacKillop with Fr Julian Tenison Woods. Generous service: Sr Carmel Parker (left) and Sr Lyn Stabler at the Josephites’ 150th anniversdary Mass last weekend.